BLACKSBURG, Va. -- Justin Robinson scored 19 points and Virginia Tech pulled away in the second half to beat No. 10 North Carolina 80-69 on Monday night. Ahmed Hill added 18 points for Virginia Tech (14-6, 3-4 Atlantic Coast Conference). Hill scored seven in a row to start the decisive 13-3 burst, which turned a 51-48 lead into a 64-51 advantage with just under eight minutes remaining. Kerry Blackshear Jr. added 16 points. Joel Berry and Luke Maye scored 23 points each for the Tar Heels (16-5, 5-3). North Carolina never got closer than eight points in the final eight minutes. The Hokies ended the first half on a 15-2 run to lead 39-32 at the break. Back-to-back 3-pointers by Berry sparked the Tar Heels early in the second half, but then Hill's 3-pointer started his personal 7-0 run. Joel Berry II had 23 points for the Tar Heels, who faded late in the loss to the Hokies on Monday. 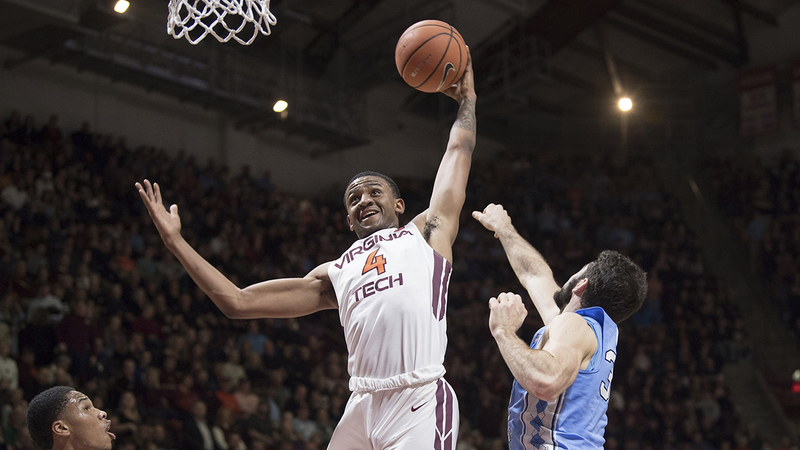 Virginia Tech: The Hokies are second nationally in field goal percentage at .521, and while they came up short of that against the Tar Heels, they outscored North Carolina 32-26 in the paint and outrebounded them 36-35.